I hope this letter finds you well. My name is Hunter and I started and currently run a collection of sites focused on credit - specifically distressed and speculative credit. Our readers come from across the world and include every major U.S investment bank and many hedge funds, law firms, and asset managers in the country. I've spent the majority of my career working in leverage finance as an investor allocating and providing capital to sub-investment grade issuers and companies in bankruptcy. You might be wondering why I am writing to you today. As an active participant in both the primary and secondary credit markets, I spend a significant amount of time gauging the risk appetite of investors that provide financing in the U.S. bond and bank debt markets, up and down the risk and ratings spectrum. Simply put: You are doing your investors and your company a disservice if you are not tapping the credit markets as soon as possible. If you are not planning a new bond or bank debt offering, call your relationship manager at your preferred investment bank of choice and put the wheels in motion. Whether it be refinancing your capital structure, financing an acquisition, dividend, or share repurchase, or simply stuffing the war chest for a rainy day, I behoove you to issue into this market. If you read the news and watch CNBC, you may assume all is wrong in the world. Unemployment rates are high, Europe is a mess, China's booming economy seems to be slowing, Middle East tensions run high, oil prices and food prices are rising, a significant fiscal cliff will hit America beginning in January 2013, etc. Of course, there are things to be positive about: Chairman Ben Bernanke is poised to grow the domestic economy with further monetary stimulus, Apple is selling a lot of IPhones, and the stock market continues to make new highs. From your perspective, and for your shareholders perspective, one thing to be immensely positive about is the seemingly endless demand for credit coming from institutional buyers. Maybe its because we have been told that interest rates will stay low for the foreseeable future and investors are looking for yield. Maybe its because corporate balance sheets are robust. Its hard to actually pinpoint the exact reasons. With that said, you, as steward of your corporation's finances, need to use this voracious demand to you and your company's advantage. Add cash to the balance sheet for that big acquisition you've been dreaming about. If you are a more risky credit and have been told in the past that "the market isn't quite ready for you", I'm here to tell you things have changed. Tier 2 and Tier 3 investment banks and syndicate desks are bringing bonds and bank debt that are oversubscribed by institutional investors. Issuer's whose debt traded at double digit yields just a year ago are bringing 10 year paper with a 5-6% coupons. Investment grade issuers are seeing record tight pricing for their paper, and in spite of that, investor demand is insatiable. In the last few days, more dividend and shareholder friend deals have been announced in the bank debt market since the go go times on late 2006 and early 2007. Don't like covenants? Not a problem in this market. Like all of us, you want to get ahead in this world. You want to do whats best for your company. You want to lower expenses, grow cash flow, and provide flexibility for your company for the uncertain road ahead. Take it from me: Issue a bond or bank financing. You won't regret it. Today marked the start of hearings in one of the most important issues in the Patriot Coal case: venue change. The issue is so important that the hearing is being telecast in both West Virginia and St Louis, something I've seen only a few times in bankruptcy proceedings. As has been reported, many parties including the UMWA and the U.S. Trustee office have motioned (or joined in on the motion) for a venue change. Likewise, many parties have filed joinders to the Debtor's objections to the venue change motions brought by the UMWA and the U.S Trustee. The UCC and DIP agent have also filed a motion objection to the venue change motions. Before I begin, I want to go on record saying Judge Shelley Chapman is brilliant. It really is an honor (pardon the pun) to hear her go to work dissecting issues in a case as important as this. To those only following tangentially, this will be a very important ruling for future case law. Judge Chapman wants to get this right, especially in light of all the political issues that have arose in the past year over "venue shopping." If she rules that PCX can keep the venue in SDNY, many cases in the future will reference her decision, assuming it stands up on a most certain appeal by various parties specifically the U.S. Trustee's office. It was marginally difficult to listen to Susan Jennik, who is representing the UMWA in the case, go head to head with Judge Chapman. Jennik was getting grilled. Prior to this hearing, I thought the venue would be changed but probably to somewhere other that West Virginia (that only has one bankruptcy judge) and is definitely inconvenient to travel to relative to some place like St Louis. 20 minutes into Ms. Jennik's discussion I thought I was definitely going to be wrong here. Her slip, which I am sure will haunt her, was bringing up the concept of a 'learning curve' in coal cases as it relates to SDNY versus a venue like West Virginia. This is a judge that is handling two incredibly technical cases beautifully (Lightsquared and Ambac) - the notion that an SDNY court won't be able to rule coherently and intelligently on a coal case is hard to conceive. Judge Chapman posed a number of difficult questions to Ms. Jennik. One I thought was quite poignant related to whether the UMWA would have brought a venue change motion if the costs to the estates were higher in a West Virginia bankruptcy vs a SDNY bankruptcy proceeding. Judge Chapman did note that no one had yet presented her facts or evidence of the numbers or costs in the case but it does bring up the interesting notion that the management team might be looking out for all parties holistically by considering costs in choosing venue. From the U.S. Trustee offices, Andrea Schwartz fared far better than Jennik. I was impressed with her abilities in the courtroom especially her ability to bring the Court back to her "smoking gun" as it were: The two New York entities were created on the eve of the bankruptcy, have very little assets, and no operations. The statute is being "manipulated." For whose benefit, she didn't quite come up with a strong answer but in light of Judge Chapman's challenging questions, I think she did a good job. (You can read the U.S. Trustee's principal arguments here: http://patriotcaseinformation.com/pdflib/509_12900.pdf). A key here is that the U.S. Trustee's argument is "in the interest of justice" which is different than the UMWA's objections. Yet to be heard is the Debtor's counsel as well as I'm sure many other parties that will want to lay out his/her arguments to the Court. I am not sure if we get a decision tomorrow, but it is my inkling that Judge Chapman will rule from the bench and then follow with a written opinion given the gravity of this decision. A venue change to West Virginia is, in my opinion, disastrous for the senior bonds. The "box theory" would fall apart in a substantial consolidation of the operating companies (sub con all opcos, keep holdco distinct) and legacy creditors would benefit greatly. In my opinion, management has significant negotiating leverage with the 1113/1114 claimants in a non-sub con situation. And that might be quite lucrative if they can engineer a rights offering with bondholders and give themselves a slug of the equity via a management incentive plan. The hearing on venue change continues tomorrow and we will provide an update on the proceedings. According to both the Barclays high-yield index and the CS HY index, yields in high yield have reached an all time low of ~6.6%. Further, over the last few weeks, traders and syndicate desks have been whispering of a simply gargantuan amount of high yield and leveraged loans coming this month. 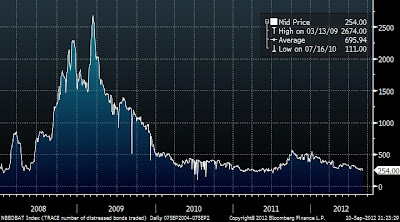 Certain desks have been advocating a move to CCC assets as they still yield approximately 100 bps over their all time low seen on...wait for it...May 2007. Being underweight any market that just rips in your face never feels good. And since many funds have been underweight both equity and speculative credit this year, many are speculating a year-end chase as funds try to catch up on performance by allocating capital to the yieldiest credits in hopes of further spread tightening. To be completely honest, this rally has felt marginally healthy to me. There have only been a few dividend deals and you haven't seeing historically weaker investment banks or desks bringing speculative deals. Seasoned issuers are coming to market with refinancing and M&A or capital structure alterations (loans refinanced into bonds). Pricing and structure have been the real stumbling block for me over the past few months. Coupons and all in yields are definitely not compensating investors for the duration of the asset class these days and covenant quality has gotten worse and worse and worse with each deal that clears. It often feels like, in larger deals, that large players are just putting in orders because 1) They have significant cash as a result of inflows to put to work and 2) The secondary market is horribly illiquid. Some desks are beginning to get cautious. Generally speaking, most strategist's targets for high yield returns have been hit for the year. To me this portends further tightening or at least grinding through year end (still have quite a bit of carry left for the year) or at least the election unless an exogenous event happens in interim. The balance of pessimism and optimism across markets feels pretty balanced which historically are good things for the market. Despite this, I am sitting on a large amount of cash. My PA has gone from very long with a smattering of shorts to a large cash position combined with a few liquidations and more shorts. The only place I see pain is in the coal and shipping space (and busted IPOs that I wouldn't look at anyways). The HILO on Bloomberg (over 50M market cap) was 260 high and 16 lows. 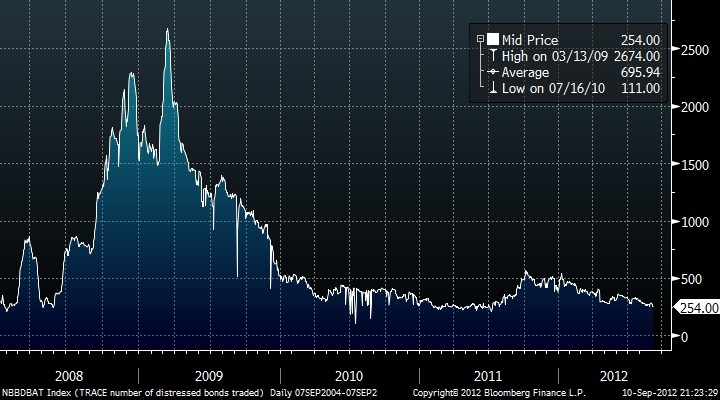 Here is a chart of the number of distressed bonds traded (distressed = over 1000 bps spread). Not terribly enticing. I think you you begin to see more M&A come down the line (already seeing it with Plains today) and maybe some speculative LBOs or MBOs that will come with covenant lite structures and terms. All to feed the beast that have been inflows this year and a re-start of the CLO machine. There's simply not enough blood in the streets for me to get excited. Every investment you make has some sort of beta / market component to it. Maybe that is only a very small percentage (say a liquidation or Lehman like situation) and some have a very heavy market component (think go-go-go equities). I am 100% focused on the former category right now and am paying close attention to both legacy and new bankruptcies to see if there are interesting places to play. That, and of course, shorting has been a big priority for me over the past few weeks as I look for aggressive accounting or thematic trades to play out and revaluations to occur in select sectors. Fun times indeed. Am I the only one that is gloomy on an up day in the markets? Readers of the blog will remember a post a few months ago where I alerted readers to my short position in China Medical Technologies. At that time the stock was trading at around $6 share and proceeded to go parabolic eventually topping out ~$12/share before collapsing. The move to the upside was triggered by a number of factors most notably buy-ins across a number of brokerages. Buy-ins were followed by more buy-ins and things got a little crazy. Eventually, as they often do, things came back to reality, the SEC forced a halt on the stock, a Cayman Island liquidation order was put into place, shareholder and bondholder lawsuits abounded, and now the Chapter 15 proceeding. After getting color of the proceedings going on in the Cayman Islands I tried to short more stock last week but was unable to find a borrow. Disappointing to say the least. "Despite extensive searches by the Liquidators (which included inquiries to hundreds of banks in the Cayman Islands, United States, Hong Kong and the PRC as described below), the Liquidators have not yet been able to locate any of the funds purportedly paid by the Transferee Companies or even to establish that any of those funds ever reached CMED. Our investigations are continuing." "The Liquidators’ investigations further indicate that the Transferee Companies are partially owned or controlled by associates of Wu and that Wu and members of Wu’s family may have received a portion of the value fraudulently transferred from CMED and the CMED Operating Companies. With the loss of control of the CMED Operating Companies, by the transfer of control from CMED’s 100% owned subsidiaries, the CMED lost its only source of revenue and was rendered hopelessly insolvent." "CMED’s chief remaining assets, its shares in its single directly owned subsidiary and 100% indirectly owned subsidiaries, are in the Cayman Islands. To date, despite an investigation that has included inquiries to over 300 banks in the Cayman Islands, the United States, Hong Kong and the PRC, the Liquidators have been unable to locate any other CMED assets anywhere in the world outside the Cayman Islands." As the company's market cap is still ~$60M, it will be interesting if the largest shareholder listed on Bloomberg (AER Advisors and the Deutsche family) will be involved in the proceedings. We will be following the proceedings.